Back in June the American Society of Magazine Editors (ASME) announced a competition to determine the top magazine covers, and out of 38 entries submitted, here are the six finalists in the "Most Delicious Cover" category as chosen by a panel of judges. And now it's up to you, America: head on over to Amazon and vote for your favorite (you need an Amazon account to vote). Voting ends September 20, 2009. Of note is the cover of The New York Times Upfront Magazine — the "magazine for sophisticated and savvy teens" that we didn't even know existed — with the photo of a boy from Greenland chomping on a raw fish, that's kinda creepy. What's Up With Gourmet's September Cover? I'm kind of disappointed by the selections here. The Gourmet burger cover is identical to like every other burger cover ever (see also: Saveur Burger cover, NYMag's Cheap Eats issue from 2007, Chicago Magazine's cover this month). The Fine Cooking and Saveur covers aren't bad, per se, but they're not awesome, and the Gourmet fries looks too much like some art director said "make it look like an Old Master take on fries" to a photo intern. I guess by default my vote goes to the Bon App ice cream, even though I will crankily insist that the cone holder makes the whole thing look like a lightbulb. Thus I have spake. fully lame. the selections, not your post. i went with the ice cream even though it's all fake and styled. show me some real food. What is a cover for? If its about capturing the eye, the mind and the all important imagination in the nano seconds our busy lives afford any covers these days, the Upfront wins the prize... its a welcomed island unique in a sea of sameness. 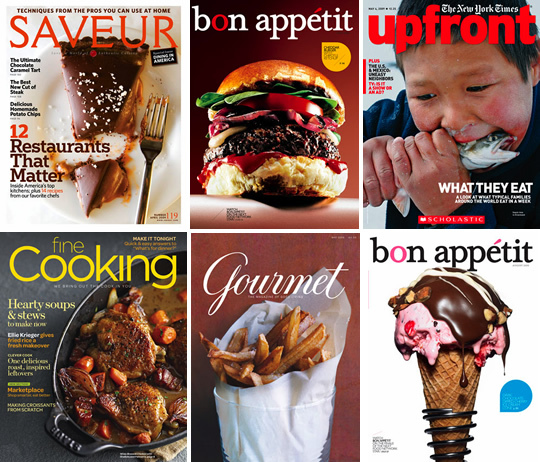 Gourmet and Bon Appetit covers just don't do the rest of the respective magazine the credit each of the magazines are to the genre. With coverlines trying to disappear into the image to satisfy the aethetic, the editor should drive the coverlines to let readers know what's inside the magazine beyond (a burger, icecream, chips... Images paint a 1000 words etc.. in this case if its about making me pick up the magazine to see what's inside, leaves me far from salivating.... Ceremoniously pushes plate to side, and moves to the cigar room. 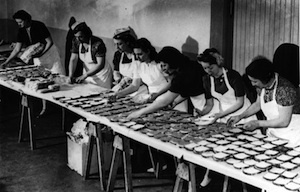 Bring on the digestif! The selections are so boring. American food magazines are always the same.. I prefer the Australia food magazines better...especially the Vogue Australia food and traveling magazine!! negative. negative. i think these are outstanding. ice cream all the way.